The tutorial explains how to add and where to find Solver in different Excel versions, from 2016 to 2003. Step-by-step examples show how to use Excel Solver to find optimal solutions for linear programming and other kinds of problems. Everyone knows that Microsoft Excel contains a lot of useful functions and powerful tools that can save you hours of calculations. But did you know that it also has a tool that can help you find optimal solutions for decision problems? In this tutorial, we are going to cover all essential aspects of the Excel Solver add-in and provide a step-by-step guide on how to use it most effectively. What is Solver in Excel? Excel Solver belongs to a special set of commands often referred to as What-if Analysis Tools. It is primarily purposed for simulation and optimization of various business and engineering models. The Excel Solver add-in is especially useful for solving linear programming problems, aka linear optimization problems, and therefore is sometimes called a linear programming solver. Apart from that, it can handle smooth nonlinear and non-smooth problems. Please see Excel Solver algorithms for more details. While Solver can't crack every possible problem, it is really helpful when dealing with all kinds of optimization problems where you need to make the best decision. For example, it can help you maximize the return of investment, choose the optimal budget for your advertising campaign, make the best work schedule for your employees, minimize the delivery costs, and so on. The Solver add-in is included with all versions of Microsoft Excel beginning with 2003, but it is not enabled by default. In Excel 2010, Excel 2013, Excel 2016, and Excel 2019, click File > Options. 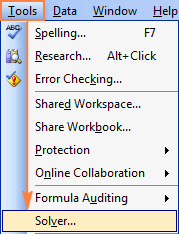 In Excel 2007, click the Microsoft Office button, and then click Excel Options. 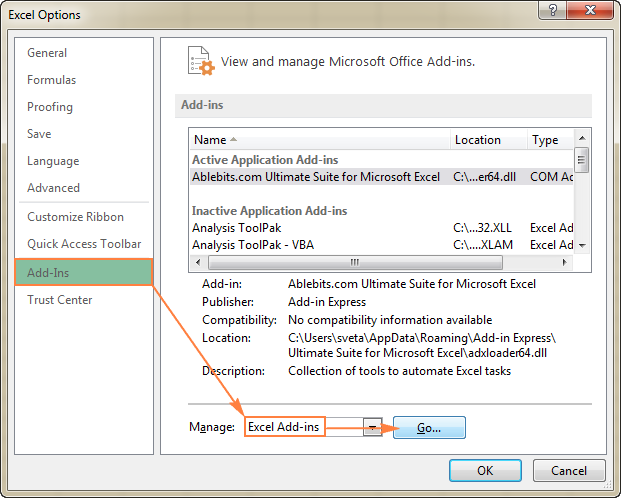 In the Excel Options dialog, click Add-Ins on the left sidebar, make sure Excel Add-ins is selected in the Manage box at the bottom of the window, and click Go. To get Solver on Excel 2003, go to the Tools menu, and click Add-Ins. In the Add-Ins available list, check the Solver Add-in box, and click OK. Note. If Excel displays a message that the Solver Add-in is not currently installed on your computer, click Yes to install it. Where is Solver in Excel 2019, 2016, 2013, 2010 or 2007? Where is Solver in Excel 2003? Now that you know where to find Solver in Excel, open a new worksheet and let's get started! Note. 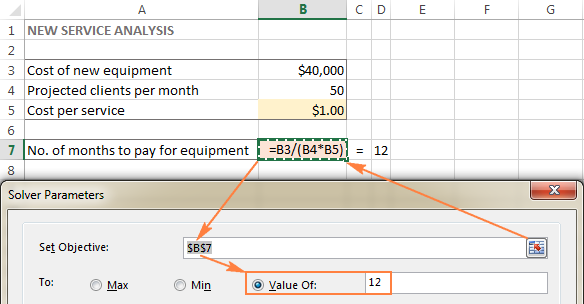 The examples discussed in this tutorial use Solver in Excel 2013. If you have another Excel version, the screenshots may not match your version exactly, although the Solver functionality is basically the same. 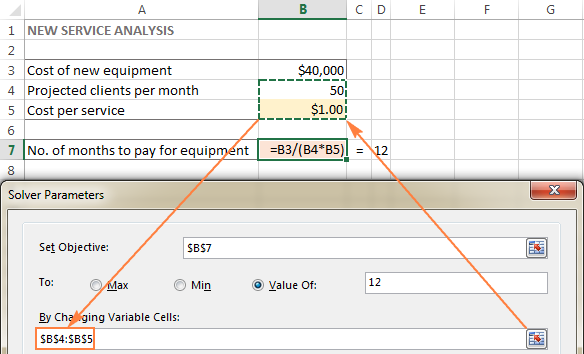 Before running the Excel Solver add-in, formulate the model you want to solve in a worksheet. In this example, let's find a solution for the following simple optimization problem. Problem. Supposing, you are the owner of a beauty salon and you are planning on providing a new service to your clients. For this, you need to buy a new equipment that costs $40,000, which should be paid by instalments within 12 months. Goal: Calculate the minimal cost per service that will let you pay for the new equipment within the specified timeframe. And now, let's see how Excel Solver can find a solution for this problem. On the Data tab, in the Analysis group, click the Solver button. Exactly what does Excel Solver do with the above parameters? It finds the optimal value (maximum, minimum or specified) for the formula in the Objective cell by changing the values in the Variable cells, and subject to limitations in the Constraints cells. The Objective cell (Target cell in earlier Excel versions) is the cell containing a formula that represents the objective, or goal, of the problem. The objective can be to maximize, minimize, or achieve some target value. Variable cells (Changing cells or Adjustable cells in earlier versions) are cells that contain variable data that can be changed to achieve the objective. Excel Solver allows specifying up to 200 variable cells. 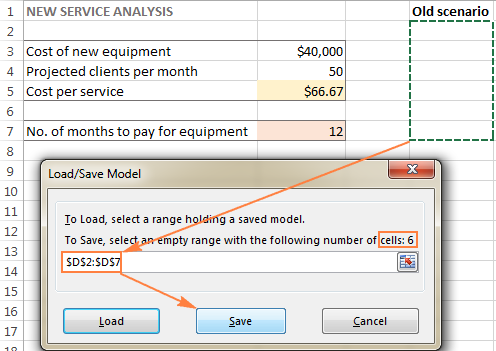 Cost per service (B5) that we want Excel Solver to calculate. Tip. If the variable cells or ranges in your model are non-adjacent, select the first cell or range, and then press and hold the Ctrl key while selecting other cells and/or ranges. Or, type the ranges manually, separated with commas. The Excel Solver Constrains are restrictions or limits of the possible solutions to the problem. To put it differently, constraints are the conditions that must be met. Click the Add button right to the "Subject to the Constraints" box. In the Constraint window, enter a constraint. Click the Add button to add the constraint to the list. 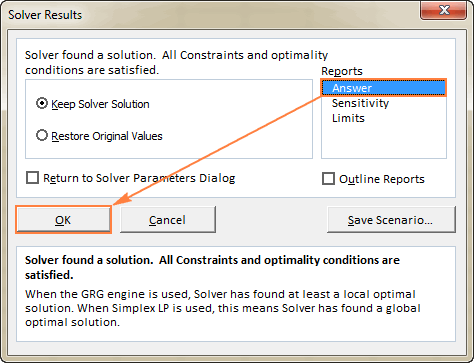 After you have entered the final constraint, click OK to return to the main Solver Parameters window. 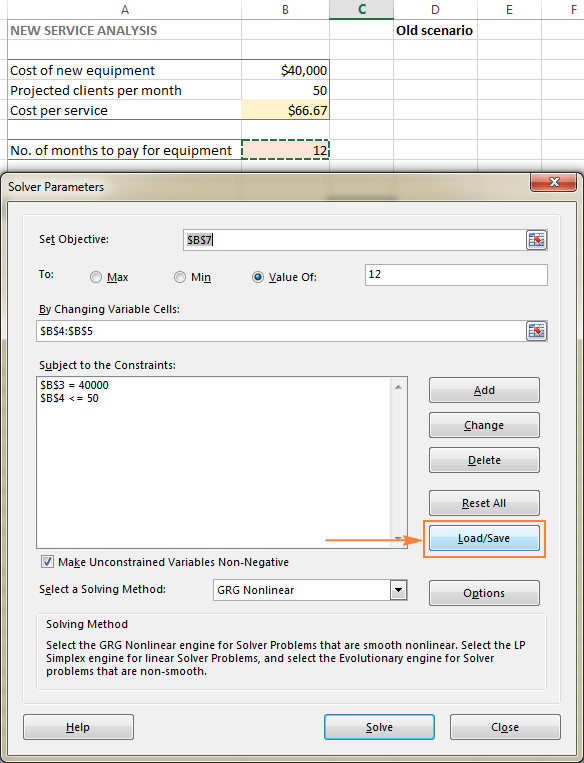 Excel Solver allows specifying the following relationships between the referenced cell and the constraint. Less than or equal to, equal to, and greater than or equal to. You set these relationships by selecting a cell in the Cell Reference box, choosing one of the following signs: <=, =, or >=, and then typing a number, cell reference / cell name, or formula in the Constraint box (please see the above screenshot). Integer. If the referenced cell must be an integer, select int, and the word integer will appear in the Constraint box. Different values. If each cell in the referenced range must contain a different value, select dif, and the word AllDifferent will appear in the Constraint box. Binary. If you want to limit a referenced cell either to 0 or 1, select bin, and the word binary will appear in the Constraint box. Note. The int, bin, and dif relationships can only be used for constraints on Variable cells. 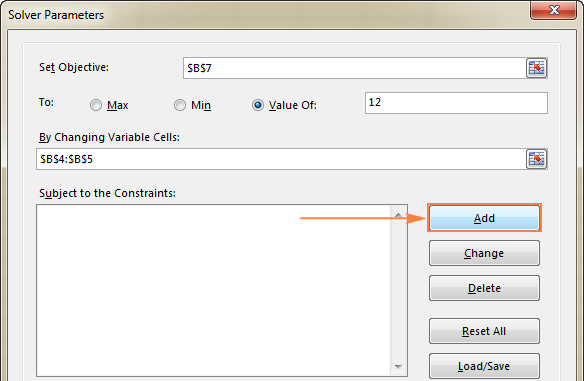 In the Solver Parameters dialog box, click the constraint. To modify the selected constraint, click Change and make the changes you want. To delete the constraint, click the Delete button. B3=40000 - cost of the new equipment is $40,000. B4<=50 - the number of projected patients per month in under 50. 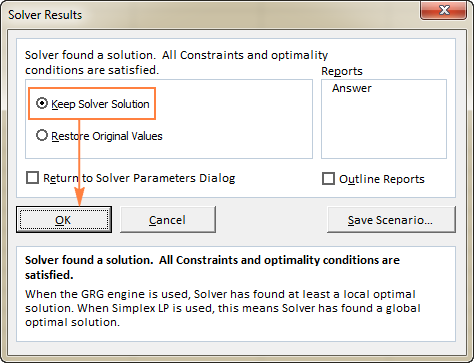 After you've configured all the parameters, click the Solve button at the bottom of the Solver Parameters window (see the screenshot above) and let the Excel Solver add-in find the optimal solution for your problem. Depending on the model complexity, computer memory and processor speed, it may take a few seconds, a few minutes, or even a few hours. The Solver Result window will close and the solution will appear on the worksheet right away. If the Excel Solver has been processing a certain problem for too long, you can interrupt the process by pressing the Esc key. Excel will recalculate the worksheet with the last values found for the Variable cells. Now that you've got the basic idea of how to use Solver in Excel, let's have a closer look at a couple more examples that might help you gain more understanding. 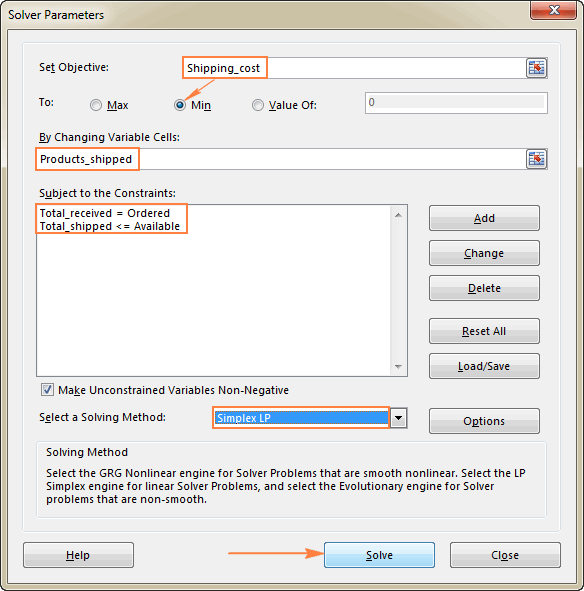 Below you will find two more examples of using the Excel Solver addin. First, we will find a solution for a well-known puzzle, and then solve a real-life linear programming problem. 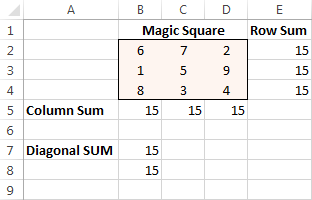 I believe everyone is familiar with "magic square" puzzles where you have to put a set of numbers in a square so that all rows, columns and diagonals add up to a certain number. For instance, do you know a solution for the 3x3 square containing numbers from 1 to 9 where each row, column and diagonal adds up to 15? It's probably no big deal to solve this puzzle by trial and error, but I bet the Solver will find the solution faster. Our part of the job is to properly define the problem. Set Objective. In this example, we don't need to set any objective, so leave this box empty. Variable Cells. We want to populate numbers in cells B2 to D4, so select the range B2:D4. $B$2:$D$4 = AllDifferent - all of the Variable cells should contain different values. $B$2:$D$4 = integer - all of the Variable cells should be integers. $B$5:$D$5 = 15 - the sum of values in each column should equal 15. $E$2:$E$4 = 15 - the sum of values in each row should equal 15. $B$7:$B$8 = 15 - the sum of both diagonals should equal 15. Finally, click the Solve button, and the solution is there! This is an example of a simple transportation optimization problem with a linear objective. More complex optimization models of this kind are used by many companies to save thousands of dollars each year. Problem: You want to minimize the cost of shipping goods from 2 different warehouses to 4 different customers. Each warehouse has a limited supply and each customer has a certain demand. Goal: Minimize the total shipping cost, not exceeding the quantity available at each warehouse, and meeting the demand of each customer. What decisions are to be made? We want to calculate the optimal quantity of goods to deliver to each customer from each warehouse. These are Variable cells (B7:E8). What are the constraints? The supplies available at each warehouse (I7:I8) cannot be exceeded, and the quantity ordered by each customer (B10:E10) should be delivered. These are Constrained cells. What is the goal? The minimal total cost of shipping. And this is our Objective cell (C12). Please pay attention that we've chosen the Simplex LP solving method in this example because we are dealing with the linear programming problem. If you are not sure what kind of problem yours is, you can leave the default GRG Nonlinear solving method. For more information, please see Excel Solver algorithms. When solving a certain model, you may want to save your Variable cell values as a scenario that you can view or re-use later. For example, when calculating the minimal service cost in the very first example discussed in this tutorial, you may want to try different numbers of projected clients per month and see how that affects the service cost. At that, you may want to save the most probable scenario you've already calculated and restore it at any moment. Saving an Excel Solver scenario boils down to selecting a range of cells to save the data in. 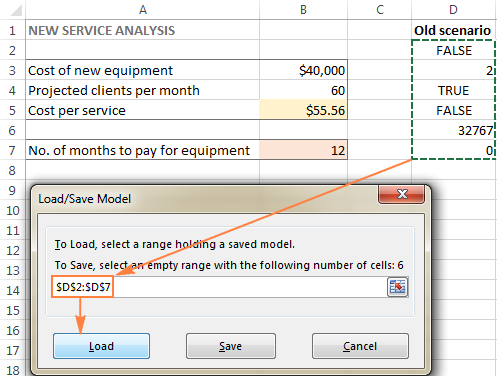 Loading a Solver model is just a matter of providing Excel with the range of cells where your model is saved. The detailed steps follow below. Open the worksheet with the calculated model and run the Excel Solver. 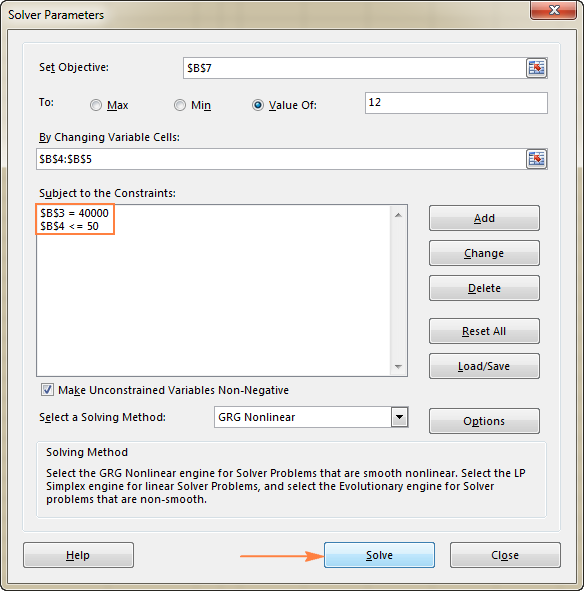 In the Solver Parameters window, click the Load/Save button. At the same time, the Solver Parameters window will show up where you can change your constraints and try different "what if" options. This will open the main Excel Solver window with the parameters of the previously saved model. All you need to do is to click the Solve button to re-calculate it. GRG Nonlinear. Generalized Reduced Gradient Nonlinear algorithm is used for problems that are smooth nonlinear, i.e. in which at least one of the constraints is a smooth nonlinear function of the decision variables. More details can be found here. LP Simplex. The Simplex LP Solving method is based the Simplex algorithm created by an American mathematical scientist George Dantzig. It is used for solving so called Linear Programming problems - mathematical models whose requirements are characterized by linear relationships, i.e. consist of a single objective represented by a linear equation that must be maximized or minimized. For more information, please check out this page. Evolutionary. It is used for non-smooth problems, which are the most difficult type of optimization problems to solve because some of the functions are non-smooth or even discontinuous, and therefore it's difficult to determine the direction in which a function is increasing or decreasing. For more information, please see this page. 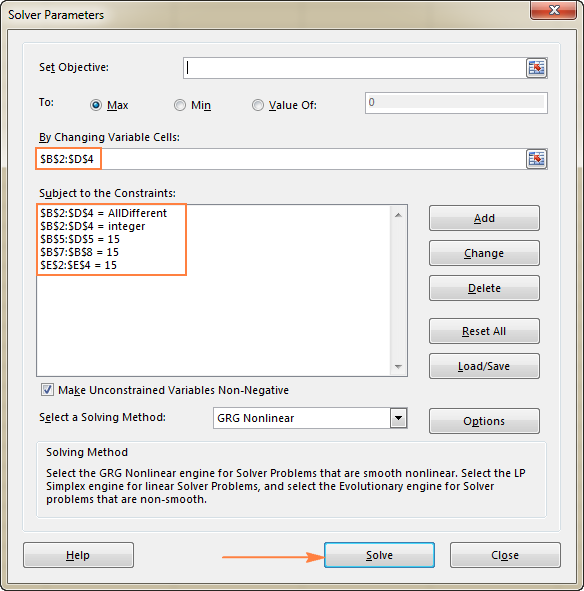 To change how Solver finds a solution, click the Options button in the Solver Parameters dialog box, and configure any or all options on the GRG Nonlinear, All Methods, and Evolutionary tabs. 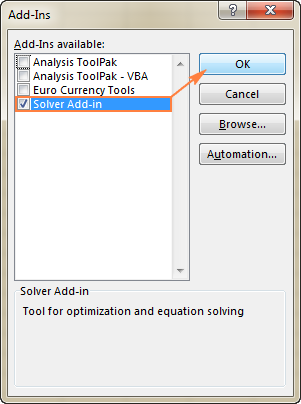 This is how you can use Solver in Excel to find the best solutions for your decision problems. And now, you may want to download the Excel Solver examples discussed in this tutorial and reverse-engineer them for better understanding. I thank you for reading and hope to see you on our blog next week. 20 Responses to "How to use Solver in Excel with examples"
Thanks for such a nice & easy tutorial of difficult commands. Many thanks I have been trying to learn this function for decades. please i was giving this assignment but i am finding it hard to understand it. please can any one help me solve it? The company has 5,200 square feet of fabricated metal available each month. products which would result in the highest profit within the given constraints. I managed to solve the problem that you posted (albeit some understandings I have changed to suit the scenario). Post your email ID and I will post the excel file to you asap. i faced a problem with exelsolver by error how can i correct that? Excellent Sir, thanks a lot. Question? I created a workbook for scheduling hours for employees working at a movie theater for 1 week. I need to have a certain number of employees for each day of the week, but I need to deal with their timeoff requests. And some of my employees are fulltime and some parttime. The timeoff request says "Can't work Saturday". I need to write a constraint based on those entries, add constraints so that employees are not scheduled to work on days when they are unavailable to work. How do I write a constraint to cover this? Great. Everything that I wanted to know more about solver is here. Fantastic Examples to make you understand the algorithm. I have tried my best to study your instruction and practice with my problem but I fail to come to an acceptable result. I hope to have your reply soon. on his personal savings to tide through. allowed and Mathew can get an annual loan in January only. a monthly loan in December. balance at the beginning of 2019. I have tried to look up similar questions online but the prob is I don’t understand how the solution was derived. Can someone help please? Thank you. I tried the Magic Square one with my students and we were not able to solve it as directed. We received error messages, such as "An AllDifferent Constraint must have either no bounds, or a lower bound of 1 and and upper bound of N, where N is the number of cells in the Constraint." However, we could not figure out where to set this parameter.